A new panto will break theatrical barriers in Malta as it is performed in total darkness. Teatru Malta's GawGaw - a Panto in the Dark will focus on the inclusion and involvement of the visually impaired. Written and directed by Marta Vella and Vikesh Godhwani, the pantomime will provide a treat for those who want to break away from the conventional Christmas treat. "I believe the binaural sounds of our panto in dark will echo on a European level. It is also an eerily fun project. 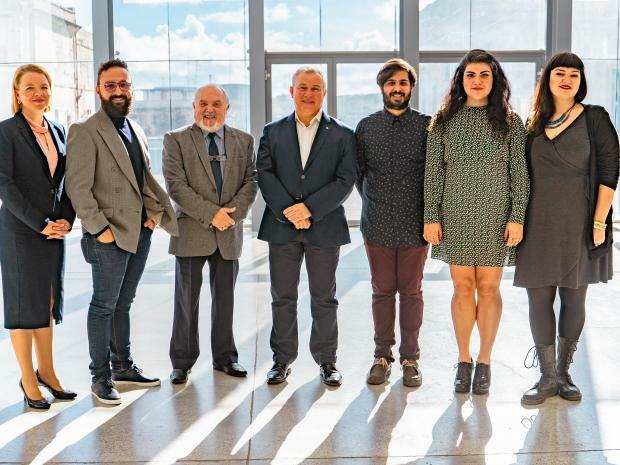 This is exactly the kind of theatre we want to create,” Teatru Malta's Artistic Director Sean Buhagiar said. He was speaking at a press conference held at the Esplora Interactive Science Centre, Kalkara, which will host seven performances. The production was launched during a news conference on Friday. The Maltese myth of the GawGaw is brought to life through the sound design of Mario Sammut as well as the voices of its stellar cast including Chucky Bartolo as Dame joined by Samuel Farrugia as Principal Boy, Davinia Hamilton and Joseph Zammit. The production was made possible with the support and collaboration of Esplora, Interactive Science Centre, il-Premju tal-President, Arts Council Malta, CRPD and LESA. Arts Council chairman Albert Marshall said Gawgaw is a project with two metaphors: the metaphor of il-Gawgaw, a local Christmas local folk tale, and the dark, whereby the dark is being presented as a means to bring all audiences together. Due to its specific nature, seating for this production is very limited. Visit www.teatrumalta.org.mt or call 2122 0255 for bookings.